In this rapidly changing world one thing remains the same - the Word of God. The Word of God holds the keys to unlocking what God has for mankind. If God is calling you to draw closer to Him, to learn more, to train in His Word, to equip yourself for the task He has given you then to enrol in Foursquare Bible College today! 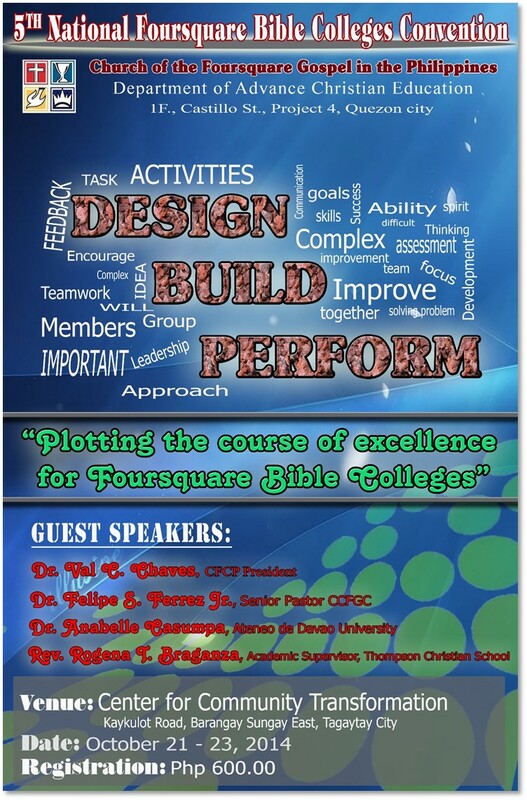 Foursquare Philippines operate eight Bible Colleges in the country. Check the one in your region. Click here. Is God calling you to vocational ministry? The Foursquare Church offers a number of training opportunities: cross-cultural outreach, short-term missions, children's ministry and many other in-church service positions. A Wonderful Visitation from the Lord! "Last August 28, 2014 during the Practical Ministry Training Program the Lord's Shekinah Glory came down and filled the bible students with the Holy Spirit. The speaker Randy Jalapit a third year student was the speaker with the theme: "The Outpouring of the Holy Spirit Today" gave a challenge that all be filled with the Holy Spirit and exercise the gifts God gave them. Many were filled and some baptized with the Holy Spirit. The following day there was a call for fasting and prayer for the Foursquare family. It was an awakening for us that we must be sensitive to the move of the Holy Spirit in the present times. Praise God."